Known affectionately as "The Bills," Bill Joseph and Bill Blair have worked ardently for 30 years to push Ohio's arts and culture into the hearts and minds of legislators. 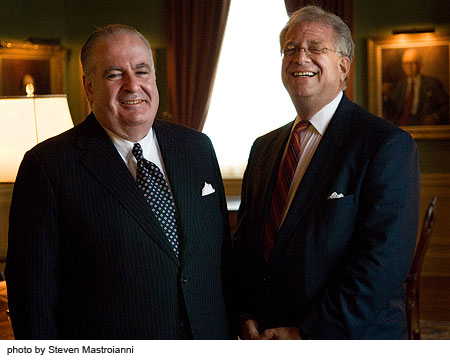 It's hard to imagine the Ohio Arts Council-considered one of the finest state arts councils in the nation-without the hard-fought and hard-won advocacy by Joseph and Blair, whose efforts have allowed the council to return millions of dollars back into the arts community. By founding the statewide advocacy organization Ohio Citizens for the Arts (OCA) in 1976, and working tirelessly with the Ohio State Legislature, they have also secured millions of dollars for State Capital Improvements grants for Northeast Ohio cultural institutions. Through its history, OCA has served as a model for the country and a catalyst for the creation of other statewide arts advocacy organizations. "They are passionate believers in the power of art in all of its forms to improve our lives and our communities," says Jerry Wareham, president and CEO of Ideastream. Name any nonprofit in Northeast Ohio and Bill Joseph is either serving on its board, is a past president, a former trustee, or a trusted and valued advisor. Bill Blair's resume reads like a template for public service. Blair was the founding President of the Ohio Foundation of the Arts, Inc., another statewide arts service corporation. He is also past Chairman of the American Arts Alliance in Washington, D.C., and is the founding Chairman of the Alliance of Arts Advocates, the nation's first arts political action committee. A resident of Shaker Heights, Joseph is a partner in the law firm Weston, Hurd, Fallon, Paisley & Howley since 1989. He received his B.A. in 1968 and his J.D. in 1972 from Columbia University. Today, he specializes in nonprofit corporate and tax law and advocacy regarding cultural, educational, and social service organizations and health care providers. Blair, a resident of Canton and Columbus, received his B.A. in History and Government, his M.A. in Public Administration, and his J.D. from the College of Law at The Ohio State University. When he served as Executive Counsel to the Director of the Ohio Department of Natural Resources, he drafted and helped pass many bills benefiting Ohio's natural resources and environment, including the creation of the Ohio Environmental Protection Agency. Without the generous, ongoing work of "The Bills," Northeast Ohio's arts and cultural landscape would resemble more of a desert than the oasis it is.